I am sitting in the wonderful, warm comfort of the second floor of our Northern Michigan home watching the Starlings huddle on a branch outside the window. It is 7* out there, 7*. They are usually a flocking, moving, busy crowd, the Starlings. They will come into our garden as a group at certain times to hit the feeder and then continue on. But, today, with the awful cold weather, they are just sitting on the branches, fluffing up their feathers, hanging out on the protected side of the house and waiting for things to warm up- or as I am seeing it, get better, waiting for things to get better. As with the creatures of nature, it is also a time of retreat for me. The stillness and harshness of a winter’s day like this urges me to stay indoors with a blanket, book and cup of tea. It feels right to stay indoors. 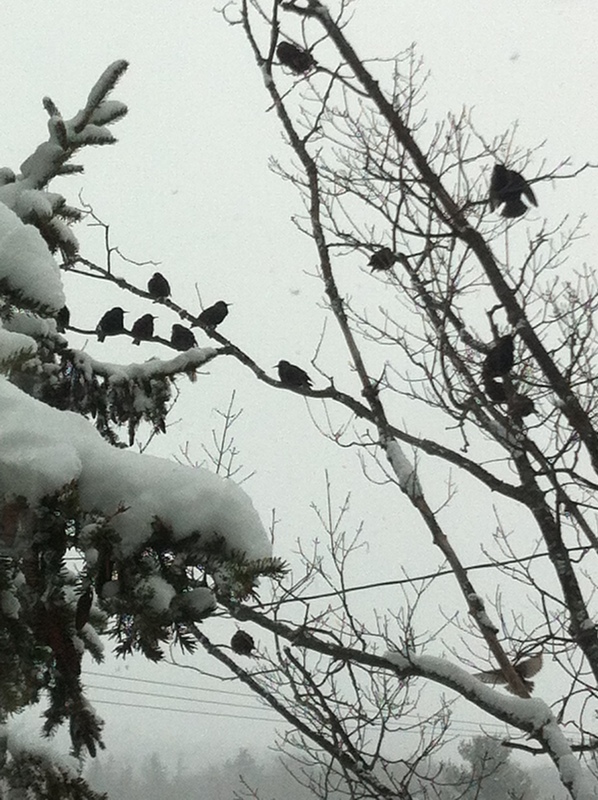 The birds are coping by fluffing up their feathers, huddling together and staying close to the feeder. (It is especially important to keep the feeders full as sources for food in nature can become scarce in the cold, snowy days of winter.) I think that I will take my cue from them. Cardigan, hot cocoa and slippers- here I come. I’m going to get cozy and enjoy this quiet winter’s day at home. And wait for things to get warmer.